Rev. Msgr. Joseph McLoone (parochial administrator) and Rev. 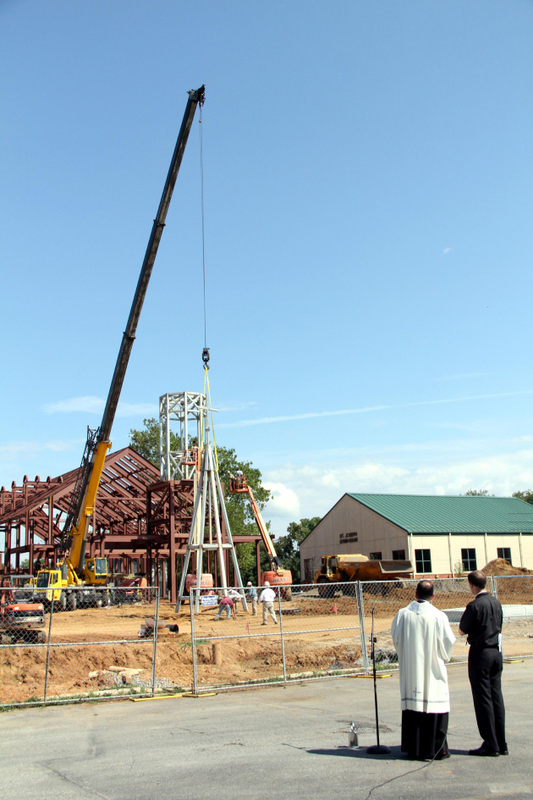 Brian Kean (parochial vicar) check out the steeple before it is placed atop the new church structure. Reverend Monsignor Joseph McLoone, the parish’s parochial administrator, opened the ceremony with prayer. 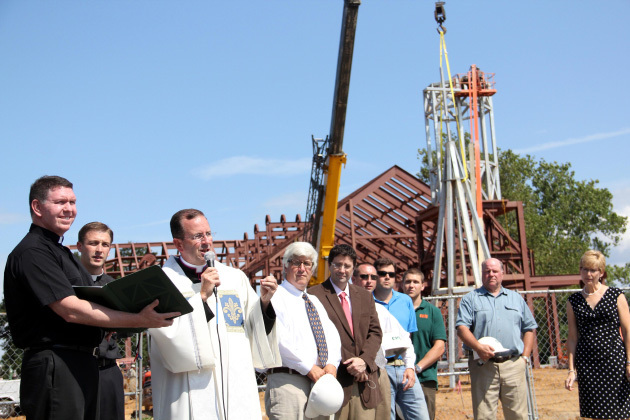 Reverend Monsignor Joseph McLoone,parochial administrator, blesses the structure before it is raised. 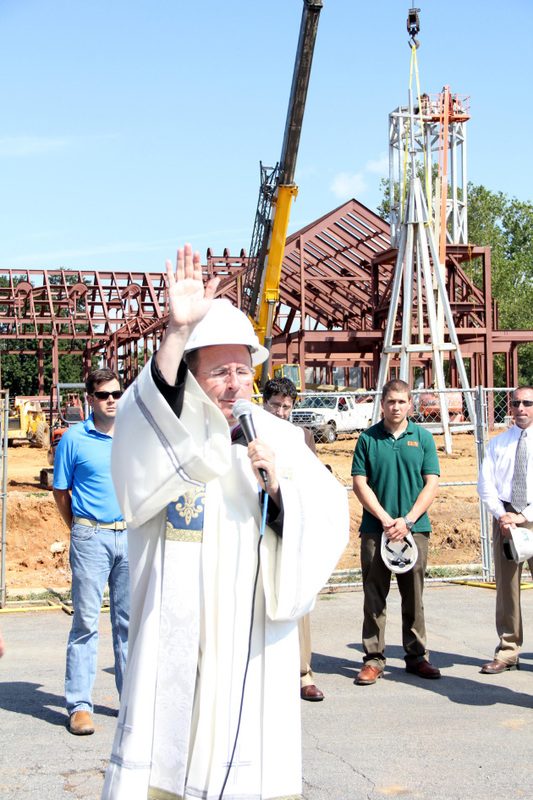 Reverend Monsignor Joseph McLoone (parochial administrator) sprinkles the last beam, which has been painted white and signed by parishioners, with holy water. 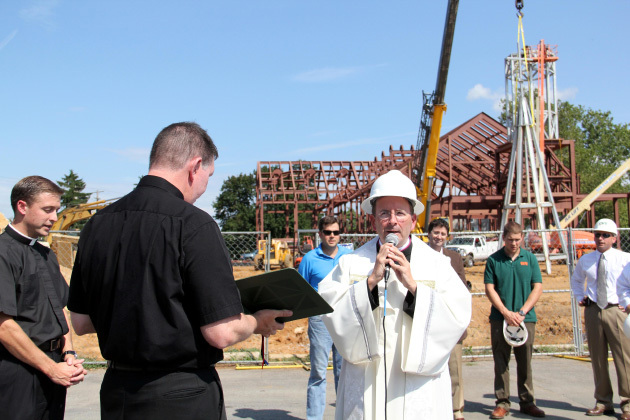 Reverend Monsignor Joseph McLoone (parochial administrator) sprinkles the structure with holy water before it is finally raised. Reverend Monsignor Joseph McLoone (parochial administrator) offers a final blessing. 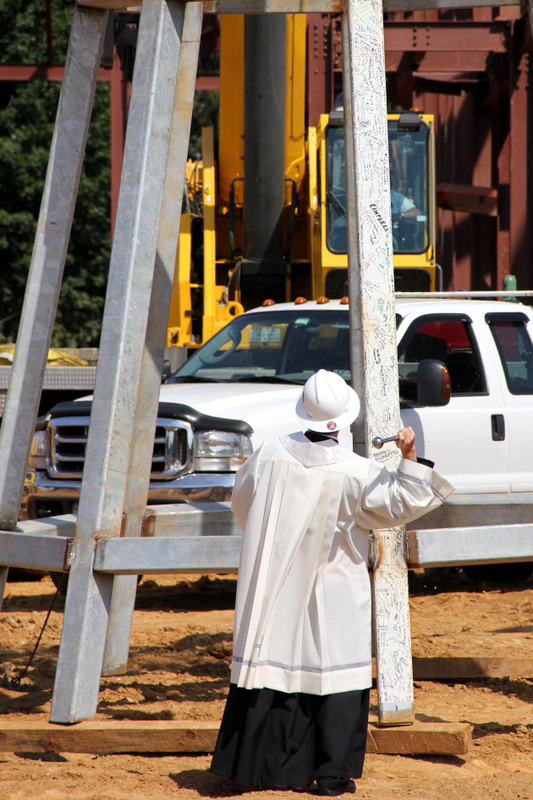 Parishioners applaud as the final beam is placed atop the structure. 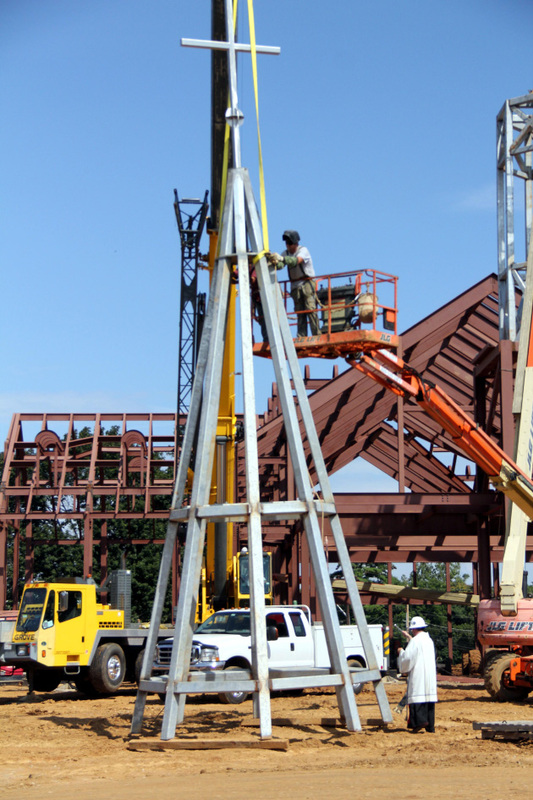 During the ceremony, the construction crew (Caldwell, Heckles, and Egan) put into place the last beam, which has been painted white and signed by parishioners. 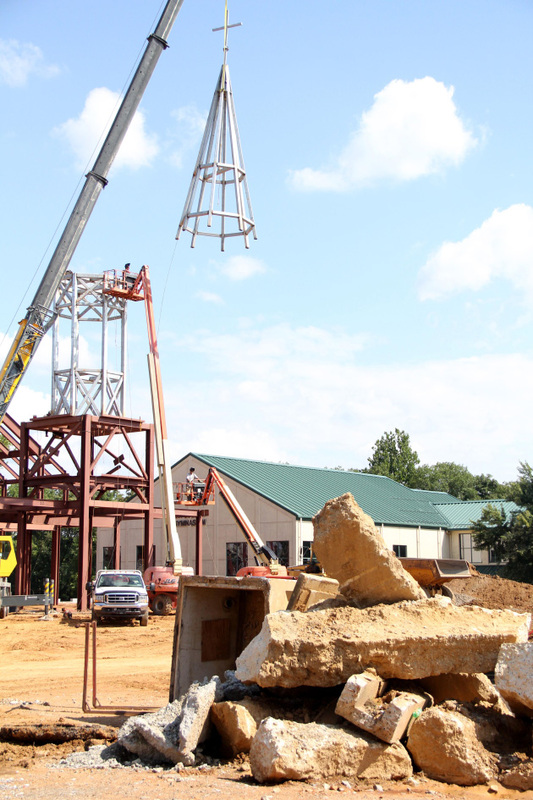 Construction on the church began in late April; it is slated to be completed by May 2013. 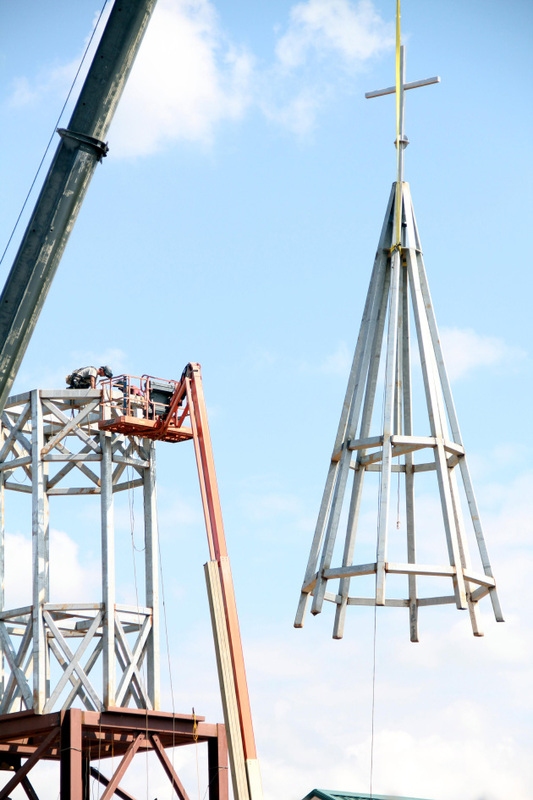 The new church is being built alongside the current one (keeping the church in use until the day the new one opens). 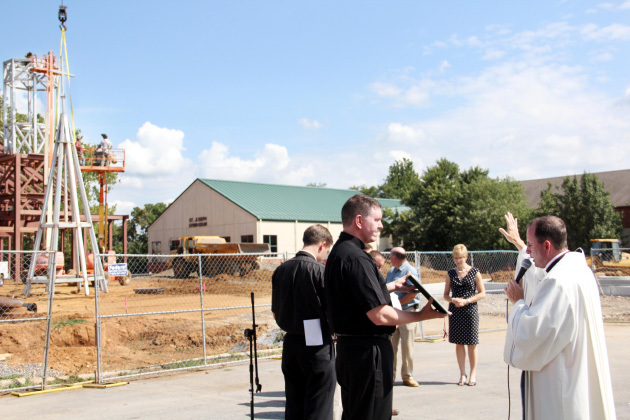 It will include seating for 1,200 people, a larger narthex, a daily Mass chapel, meeting rooms, adequate parking, and transepts to allow for future expansion. 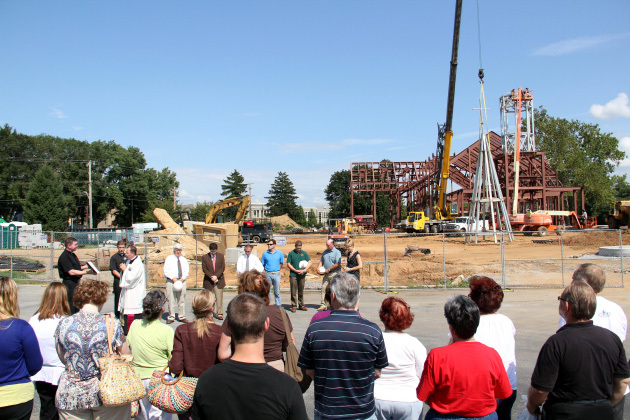 To accommodate future growth, the parish began planning for expansion in 2007 and kicked off a campaign – “Cherishing our Past ~ Embracing the Future”- to raise funds for this project in February 2010. 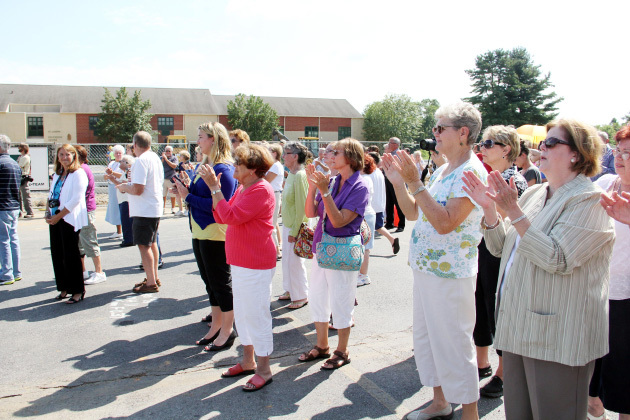 The parish has received pledges totaling approximately $5.3 million of its fundraising goal of $6 million. The project is estimated to cost $9.6 million. Saint Joseph, the second-largest parish in the archdiocese, has nearly 4,600 families and more than 15,000 parishioners. Since the capital campaign kicked off in February of 2010, more than 500 families (more than 1,200 people) have joined the parish. Saint Joseph Parish was founded in 1851; its first church was built in 1852 on Bradford Avenue in the Johnsontown area of Downingtown.